A WINDOW INTO ANTARCTICA'S FROZEN OCEAN – Our project was conceived in order to provide researchers with real-time, high-quality scientific data of ocean conditions under the solid sea ice cover of Antarctica's frigid Southern Ocean. The McMurdo Oceanographic Observatory–the MOO–was installed by scientific divers and other personnel in late 2017, seventy-feet (21m) below the frozen surface of McMurdo Sound in the southwestern Ross Sea, Antarctica. The installation consists of a live-streaming HD video camera that can point and zoom in all directions, a high-definition underwater microphone, and sensitive sensors that measure basic ocean conditions such as temperature, salinity and tides. Real-time data supports scientific research projects, public outreach, and logistics operations at McMurdo Station–the United States Antarctic Program's flagship research outpost in Antarctica. Our ultimate goal is to provide all video, audio and ocean condition data from the Observatory in real time to a worldwide audience via the internet. The MOO is part of a scientific research project hosted at the University of Oregon, Eugene, supported by the U.S. Antarctic Program and funded by the U.S. National Science Foundation's Office of Polar Programs. A WONDERLAND OF ICE – Located 2,500 miles (4,000 km) south of New Zealand, McMurdo Sound is the southernmost accessible marine environment in the world. It is bounded by the Antarctic continent to the west, Ross Island to the east, and the massive, floating Ross Ice shelf to the south. Mount Erebus, a 12,500-ft (3,800m) active volcano continuously belches smoke nearby. A thick crust of floating sea ice, 8-feet (2.5m) thick or more, conceals the near-freezing seawater for much of each year. The seawater there may even dip slightly below it's freezing point, driving the growth of a shimmering blanket of anchor ice that covers the shallow sea floor. Some of the worlds most cold-adapted marine life inhabits this extreme marine environment. A diversity of antifreeze protein-bearing Antarctic fishes populate the water column and the sea floor. Unique and diverse invertebrate animals are found in the many varied habitat types. Weddell seals, the southernmost breeding mammal in the world, survive here year-round, diving for food through holes they maintain in the thick ice cover. If the sea ice breaks out in the summer, they may be visited by leopard and crabeater seals, orca (killer wales), several species of baleen whales and a handful of seabird species including Adelie and emperor penguins. The coastal research outpost there, McMurdo Station, has long been a hub of marine research for the National Science Foundation's U.S. Antarctic Program. With its interdisciplinary focus, the MOO substantially expands our ability to monitor and understand this remote, unique, ice-laden marine environment. EYES, EARS AND SENSORS UNDER THE ICE – The MOO is the first of it's kind in the Southern Ocean surrounding the Seventh Continent. 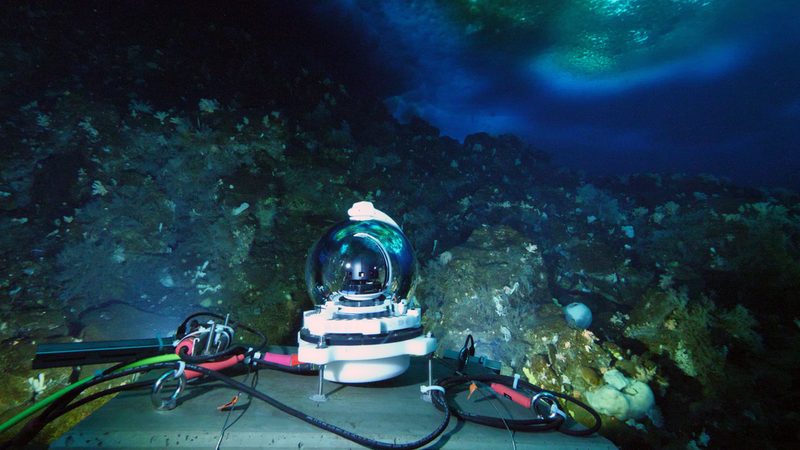 Controlled by researchers 9,000 miles (14,500 km) away at the University of Oregon, USA, it streams live video, audio and ocean condition data from an icy habitat that few people have ever visited. The primary purpose of the MOO is to support research studies on the world's most cold-adapted fishes, the Antarctic notothenioids. Its sensors observe and measure the fishes' environment continuously, providing new insight into the environmental challenges that these antifreeze protein-bearing fishes face over the course of their lives. At seventy feet down, a live-streaming, controllable HD video camera is nestled inside a self-cleaning glass dome, autonomously recording daily video tours and capturing images of a multitude of nearby features every hour of every day. 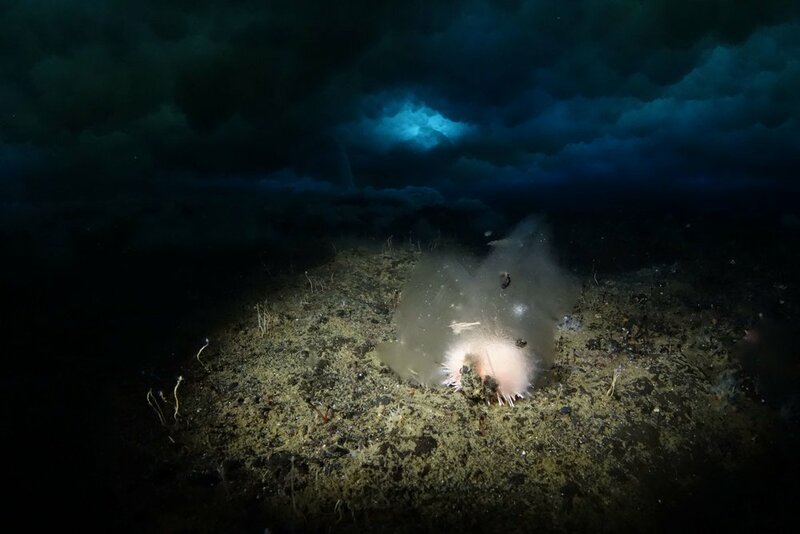 Real-time images from under the Antarctic sea ice are made available to the general public and live video is displayed for personnel at McMurdo Station. A full-spectrum, high-definition microphone (hydrophone) records continuously, documenting the under-ice soundscape of McMurdo Sound at a resolution–and over a duration–never before achieved. These audio data are providing new insight into the behaviors of resident and transient marine mammals, sounds produced by invertebrate animal activities and, by listening to its creaks, cracks and groans, how the integrity of the sea ice cover changes over time. The MOO's sensitive ocean condition sensors record the only formal long-term, archival-quality seawater temperature record from McMurdo Sound, the southernmost accessible marine environment in the world. A salinity sensor further allows scientists to follow as different water masses occur in the area, and a pressure sensor gives information on how tidal changes contribute to the changing conditions. THE FIRST OF ITS KIND – In collaboration with our project staff, the backbone of the MOO was engineered by View Into the Blue of Boulder Colorado, incorporating their signature self-cleaning HD underwater webcam. It was then shipped to and tested in the lab and seawater aquarium tanks at McMurdo Station in October 2017. Working in frigid spring conditions, four concrete anchor blocks (200 to 3,500 lb, 90 to 1,500 kg) were sunk to the sea floor through a hole drilled in the thick sea-ice cover. 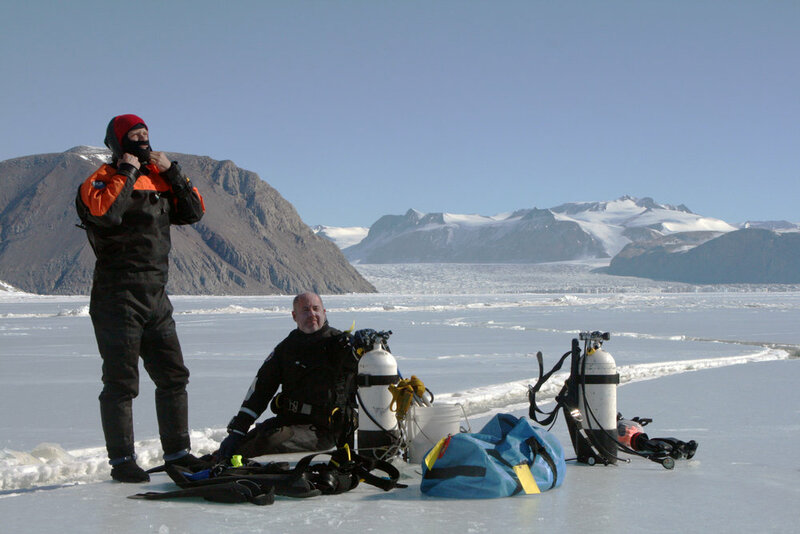 In numerous under-ice excursions, our project's drysuit-clad scientific divers submerged and connected the parts of the MOO–one piece at a time–in the near-freezing seawater. Each of the thirty SCUBA dives required for reconnaissance, installation, and testing of the equipment lasted only about forty minutes. A 300-foot-long surface supply cable, protected by an 80-foot-long steel pipe as it penetrates the sea ice along shore, routes data, power and internet between a small structure at the outskirts of McMurdo Station to the MOO's power and data and hub on the sea floor at 70-feet (21m) deep. Numerous cable connections were mated wet–with frozen hands and greasy gloves–under an impenetrable ceiling of ice. 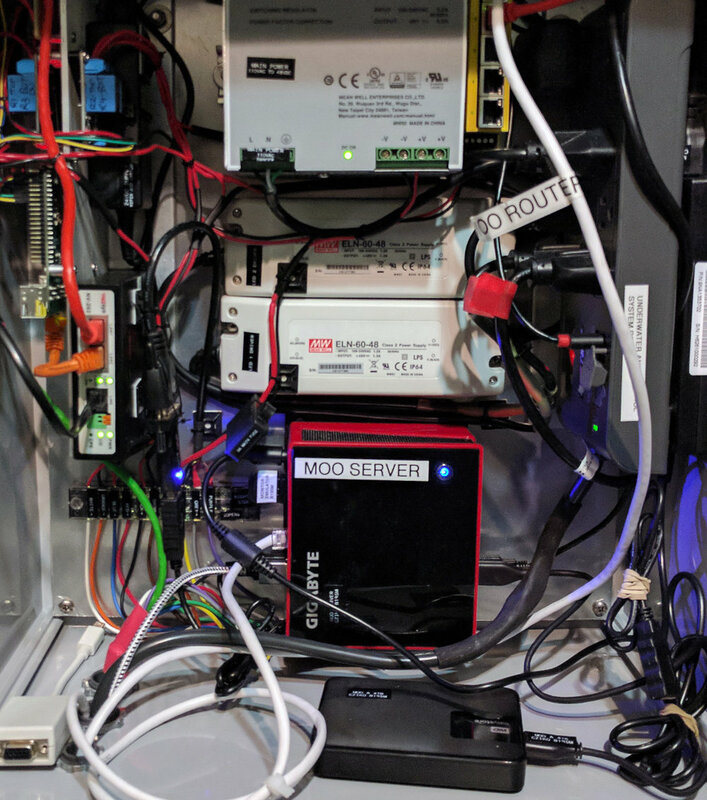 Since November 2017 the MOO has been continuously collecting data, with most of it archived in a hard drive storage array at McMurdo Station. Despite the limited internet connection to Antarctica, our personnel can monitor, control and sample the data in real time from anywhere in the world. While conducting research at McMurdo Station, we are able to access the full video, audio and data streams. In addition to supporting specific marine research projects, the ultimate goal of our project is to provide all video, audio and ocean condition data from the under the ice in Antarctica in real time to a worldwide scientific and public audience. Full realization of this goal may have to wait for McMurdo Station to upgrade its satellite internet and internal network capabilities, expected to begin over the next few years. This project is a work-in-progress: with continued computer programming from afar and plans to upgrade and add new sensors during our visits to Antarctica, we will continue to enhance the ability of the McMurdo Oceanographic Observatory to fulfill its mission. What is the McMurdo Oceanographic Observatory? Where is the McMurdo Oceanographic Observatory? Why did we develop the McMurdo Oceanographic Observatory? 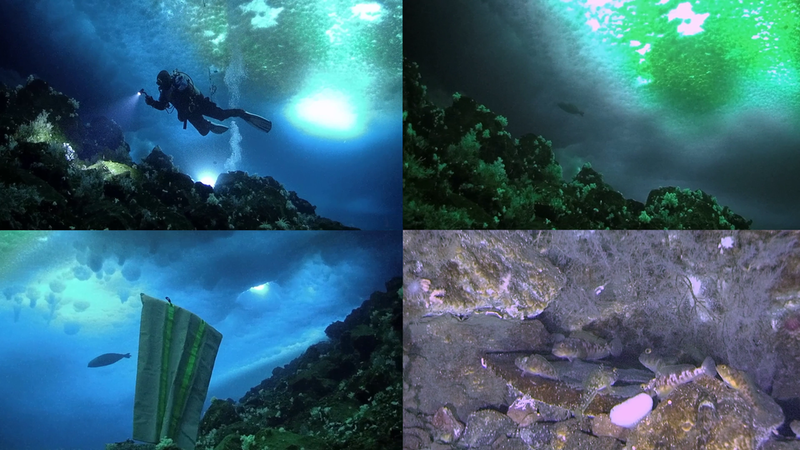 How did we install the McMurdo Oceanographic Observatory?